Seaweed is really good for you and that is great news for those of us that love a seaweed sushi wrap. Seaweed is becoming more popular as an ingredient and a snack and we all know that it is full of important nutrients and very few calories. But just how good for you seaweed and what type of health benefits does it actually confer? We have already written at length about several healthy varieties of seaweed including dulse, bladderwrack and hijiki. There are many other types of edible seaweed all of which are packed with nutrition and can deliver a wide variety of health benefits. Despite its common name, seaweed can grow in places other than the ocean. It is actually the general name given to a number of species of marine plant and algae. It grows in different types of waters including lakes, rivers and the sea. Algae that grows in the sea is typically edible while the freshwater variety is more likely toxic and therefore inedible. Seaweed is divided into several different categories which are based on cell structure, pigments and other factors. Green algae like sea lettuce, sea grapes and ulva. Brown algae, a group which includes kelp, kombu, arame and wakame (used in miso soup). Red algae including laver, dulse and nori (used in sushi dishes). Blue-green algae like chlorella and spirulina. Seaweed is so good for you because it is so nutritionally dense. It contains a host of minerals and vitamins that can do a great deal for your body. Seaweed is incredibly rich in vitamins and various minerals. The actual nutrient content of the seaweed you eat varies according to where it grew. Different types of seaweed therefore contain nutrients in different amounts. Seaweed also contains much smaller amounts of various other nutrients including vitamins A, E and C, phosphorus, choline as well as healthy Omega 3 and 6 fatty acids. Dried seaweed is packed with more nutrition than fresh seaweed. Just a tablespoon of dried algae would be enough to provide you with the nutritional amounts above. When we talk about vitamins, vitamin K often takes a back seat to its more famous cousins. However, vitamin K is an extremely important nutrient and seaweed is an excellent source. Vitamin K plays a role in blood clotting because of its relationship with your platelets. When you are injured or wounded, vitamin K is needed to send a signal telling the platelets form blood clots which will put a halt to bleeding. Some varieties of seaweed can quickly help you reach you recommended daily intake of vitamin K. For example, a single portion of kelp provides you with 26 micrograms of vitamin K which is over 25% of your RDI. Simply adding more fiber to your diet can do a great deal for your digestive health and may well reduce the risk of serious disease like heart disease and even cancer. Seaweed is a great way to get more fiber into your diet. While fiber is present in all plant based foods, seaweed also contains certain carbs that we are unable to digest. They include galactan, fucan and carageenan. These carbohydrates become the food for your healthy intestinal bacteria. By adding some delicious and nutritious seaweed to your diet, you can also boost your calcium intake and enhance your bone health. The bulk of the body’s supply of calcium gets used to keep the bones strong and teeth healthy. Calcium is also used on smaller amounts to keep help the muscles contract. It also helps cell communication and nervous system health. Many types of seaweed including wakame and kelp contain good levels of iron which is necessary for many bodily processes including energy and circulatory system support. Many people suffer from iron deficiency which can result in anemia. This condition is characterized by fatigue, shortness of breath and pale skin. The recommended daily dose of iron is 8 mg for men and 18 for women. One cup of wakame or kelp offers around 1 mg or iron while a single teaspoon for dry spirulina offers twice that amount. Probably the best-known of seaweed’s many health benefits is that it is an amazing source of a unique nutrient missing from most every other type of food. I am talking about iodine which is essential to maintaining the health of your thyroid. A healthy thyroid is essential because of its role in the production and regulation of your hormones. If your thyroid malfunctions, it can lead to a range of unpleasant symptoms including muscle weakness, fatigue, emotional problems and elevated cholesterol. Iodine deficiency is relatively rare nowadays because of the iodine is now added to salt. Nevertheless iodine deficiency still exists and is again on the rise owing to a number of factors like poor quality salt and aversion to eating salt. Adding seaweed to your daily diet can go a long way to addressing this issue and protect you from thyroid dramas. 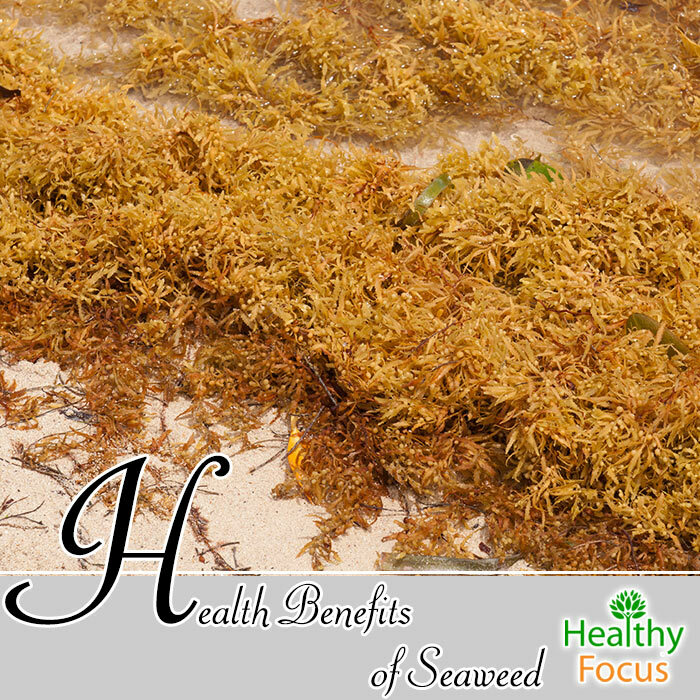 A single gram of brown seaweed can offer between 5 and 50 times more than the recommend intake. As an ingredient in soup or with bone broth. Spread on a piece of wholewheat toast which is a traditional snack in Wales called larva bread. Sprinkle some dried flakes over your salads, rice dishes, meat dishes or soups. When it comes to eating seaweed, there are a few areas of potential health concern. While iodine is essential for proper thyroid health, studies have found that consuming too much iodine can have the opposite effect. The authors of a Japanese study observed that women who consumed between 15 and 30g of kombu were more likely to have higher levels of thyroid hormones. Seaweed contains certain carbohydrates our systems can not digest. The carbohydrates can lead to an overgrowth of bacteria in the small intestines. Carageenan is known to cause problems so it is best avoid seaweed which is high in carageenan. Seaweed can contain certain toxic metals. Just how badly your seaweed is contaminated depends on a number of factors such as where it was harvested and the type of toxins circulating in the waters. The levels of heavy metals in seaweed vary a great deal and can even vary from one batch to another. If you want to be absolutely sure you are getting a clean, healthy product, buy your seaweeds from a company that does regular 3rd party lab testing.